Some people are afraid to hope because they have been hurt so much in life. They’ve faced so much disappointment that they believe they can’t face even one more. They refuse to hope so there’s no chance for them to be let down. The avoidance of hope is a defense mechanism. It’s a type of protection against being hurt. In order to escape pain, you simply refuse to hope and believe that nothing good will ever happen to you. You are losing precious moments of your life to discouragement. Whether you realize it or not, you are setting up a negative lifestyle, for what you think, you become. Mindset is a choice. Make the choice to reframe your thoughts and rework your perspective. Change your mindset and empower yourself to hope. 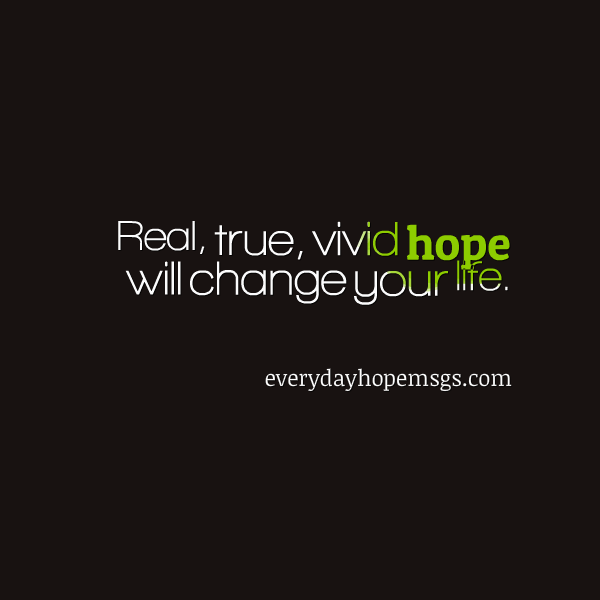 Hope will not let you down. It will change your life. If you don’t expect anything good to happen, you won’t be disappointed. You’ll miss out on the beauty of life and the good things hope brings. Go ahead and hope. Become the kind of person who plans, but be resilient enough to navigate with hope if all doesn’t go according to plan. Stay focused, stay thankful, stay hopeful.